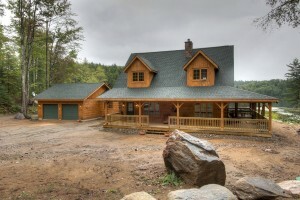 Since 1979, Confederation Log & Timber Frame has been setting the standard for complete and well appointed log homes. A leader in log home innovation, our packages reflect our dedication to providing the most advanced log homes you’ll find. Here you will find what is included in our packages organized by exterior shell, optional package, as well as turn key solutions. 6×12 or 8×12 Eastern White Pine or Western Red Cedar. Winter cut and double tongue & grooved for optimal fit. Wall system includes Thru-Bolts, Wall Splines, all gaskets, etc. Pine posts and beams (interior and exterior) for stairs, decks, porches, etc. Trusses/Framing, plywood, ice & water shield (4 rows), lifetime architectural shingles, etc. 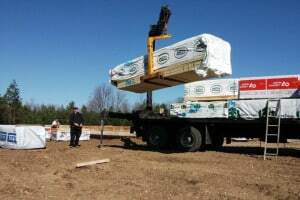 2×4 & 2×6 framing, sheathing, and 1×8 or 2×12 siding. Rough Sawn fascia makes stain application penetrate the wood deeper. Double or triple pane, wood or exterior clad with a variety of grill options. Company options include Laflamme, KV, etc. Weiser door locks keyed alike and available in 3 different finishes. Rough sawn 1×4 window and door trim. 2×4 and 2×6 interior studded walls. All framing material marked as ‘Premium,’ ‘J-Grade,’ etc. BCIN certified blueprints for permit application, sub trade quoting, etc. Pressure Treated, Cedar, and Composite are all available. Batts, BIBS (Blown In Blanket System), or Spray Foam for gable ends, dormers, and roofs. Decorative or Structural accents, floor systems, sunroom, entry, gable ends, porches, etc. Sikkens interior and exterior (3 coats) stain. Available in 8 standard colours. Interior window, door, and baseboard trim packages available. Pine doors for interior rooms. 2×12 log siding for interior and exterior applications. 1×6 T&G pine for interior ceilings. Interior pine stairs to basement and upper floor. Variety of spindles available. If you wish to have Confederation build your entire project, we can handle it. After a consultation with a knowledgeable Confederation representative and our builder, we can put together a complete budget based on your preferred finishes. Items like flooring, kitchen, fixtures, fireplace, etc. will all be mapped out with allowances and options provided. Rest assured that we have the experience, know how, and expertise to build your Confederation on time and on budget.